Unforgettable is returning to television tonight in its new home on A&E. This means Poppy Montgomery is back as Carrie Wells, and she spoke about two-time cancelled series in a new interview with TV Insider. Now the series airs on cable, and that does offer some freedom. Montgomery teased that there is “more cursing” with the move to cable. The move to cable also caused a cast shake-up. Fans of the series will see several new faces when season four begins. Are you fan of Unforgettable? Are you ready to see it back on the air? Tell us what you think. More about: Unforgettable, Unforgettable: canceled or renewed? 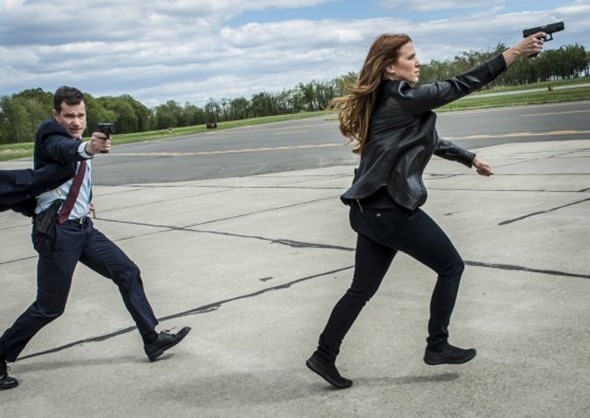 Unforgettable: Should It Be Cancelled or Renewed for Season Two? Unforgettable is one of the best shows on television. Poppy Montgomery is superb and the other actors are extremely good also. It is such an unusual circumstance, Poppy who is on the Police Force has the ability to remember anything from any time in the past. This happens to be a “reality” that some people actually have. which is so different with such s wonderful csst. This show needs to be on permanently. It is said that Marilu Henner, who appears as “Aunt Evie” in a single episode in 2011, has that ability in real life. This is one of my favorite shows. I am getting a little irritated with TV these days. Shows that are good are getting cancelled for shows that are really bad. Please bring Unforgettable back. I record it all the time.I love the actors. I think this was a great detectives how, my husband and I never missed it..please bring it back on!!!!! Please renew unforgettable. Al has to live. This show just keeps getting more and more interesting and intriguing.Please don’t end it now. Don’t cancel this show it’s great. Al needs to live. OK. I am confused. There were three episodes on 1/22. In the second episode, the female captain was on leave, but there was no explanation for this. Then, at the end, Al is shot. Then in the third episode, he is just fine. What’s going on? The 9pm episode was episode 11 while the 10pm episode was episode nine. They showed them out of order for some reason. Next week’s are #12 and #13 (the last of the season).